According to the segment on nutrition my maintenance calories should be 2996. Lose It! lists my maintenance calories as 2398. However, I believe that if I eat either of those levels I will gain weight. For one thing, I've lost, from my highest recorded weight, a bit over 90 lbs already. And as it turns out, metabolism slows when weight is lost. This is part of the "statis" effect mentioned. To test this theory I've set Lose It! to "maintenance" for this week, starting today and running through January 31. My goal to lose 45 lbs is still intact. My goal to start determining how to maintain all of my loss is intact. Determine actual maintenance calories as of today's weight. Determine appropriate deficit to re-start fat loss at 2 lbs per week, starting February 1. Continue to consume at least 170 grams of lean protein per day, but focus nutrition to include high protein/high carb/low fat on strength training days and high protein/low carb/higher fat on non-strength training days. Create a 3 day per week strength training program. Do cardio or yoga on non-strength training days. So...I've come to this class after being a member of Fitocracy for about 9 months. I initially got into the idea of using apps to help me lose weight after reading a magazine article on the subject. The first app I got was Lose It!, which is a handy way to count calories and keep an eye on macronutrients (protein, fat, carbohydrate). Within a short time of trying Lose It! I figured I'd search the app store for other fitness apps, and that's when I found Fitocracy. I've never been a gamer, even sucked at PacMan, but the instant feedback of earning points for logging my first efforts was really motivating. I chose some non-specific goals like "losing weight" and "being able to run," joined some groups and started connecting with people. I was starting to see some pounds come off via diet and the kudos from fito-friends kept me tracking exercises. I was scared much of the time, embarrassed when I'd go out running, feeling self-conscious riding a bike to the farmers' market, etc. but I kept doing it anyway. Over the last 9 months I've kept track of scale weight, tape measurements and clothing sizes. 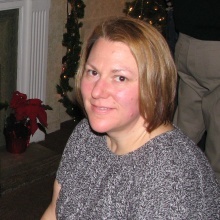 When starting on Fitocracy I was wearing a US size 24W. I'm now comfortably down to a US size 18. I've lost 8 inches from around my navel and dropped over 60 lbs. I've gained visible muscle, particularly in my arms and legs. I've even lost two ring sizes and have to wear my wedding ring on my middle finger...where it's currently loose! My goals now include losing more fat so that the scale reads 170 with muscle, getting down to at least a US size 12, and learning how to maintain once I get there. I've never been a thin person and I have a large bone structure for a woman. So even when I was younger and wasn't particularly fat, I was always bigger than any of my friends. Body image issues were compounded by having a very petite mother and grandmother who tended to look at me like I was a giant failure for my size. What can I say, I took after my dad and his side of the family...no petites there! Anyway, growing more and more obese over the years, yo-yo dieting, etc. has left me having a hard time realizing now how much smaller I am. While I started Fitocracy at a 24W, my largest pant size was 30W. I was massive! The most important thing for me really is functional fitness. As I had gotten bigger and bigger there were many life activities I had given up: roller coasters, flying, going out dancing, being social, bike riding, the list could go on & on. Now I want to, and do, all of those things plus more! Which leads me to the cover photo. It doesn't look flattering right? Maybe you think it was a "pre" photo. It is not. 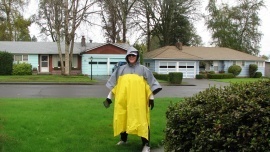 It is me, completely layered up, including the huge yellow parka, because on Veteran's Day 2012 I went out for a walk/run to raise money for Wounded Warrior Project. I went over 7 miles that day.